Slovakia is one of the most underrated countries in Europe in our opinion. We realize it every time we visit this country and that has happened quite often lately. We discovered 6 of its 9 national parks last year and we want to tell you about them! Chances are high that you’ve actually never heard of any or most of them. But you totally should. So let us introduce you to these amazing parks via a featured hike from each one. These are not necessarily our favorite hikes but these are the ones we think are the best introduction hikes. We tried to pick nice and easy hikes that still give a taste of the varied wonders of each of these parks. So welcome to the national parks of Slovakia! Shall we start? With lush forests, wild creeks, a bunch of adventurous ravines and glens and countless waterfalls Slovak Paradise National Park is truly nature lovers’ paradise. Iron stairs, series of ladders and chains help hikers to explore this wonderland safely. There’s no need for professional climbing equipment but waterproof hiking boots come handy because there’s countless creek crossings on the way. 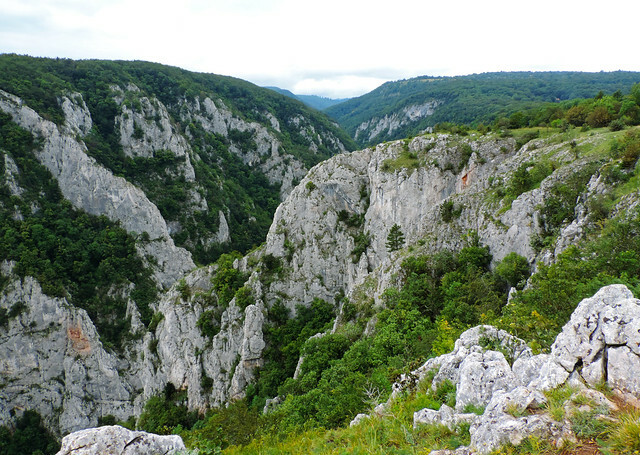 One of the most popular ravines in the park is called Dry White Gorge (roklina Suchá Belá in Slovak). It’s easily accessible and relatively short but still charming and adventurous. It’s that typical hike that whet your appetite for more. At least it did in our case. The narrow gorge runs in a glen and there’s 4 lovely waterfalls on the way – the highest is 29.5 meters and the smallest is 8 meters. The trail (as most of the glen hikes in Slovak Paradise) is one-way: only up. There’s an easy trail from the top that leads back to Podlesok through the lush green forest outside of the glen. Read our introduction post about Slovak Paradise for more ideas! The best place to start is Štrbské pleso. 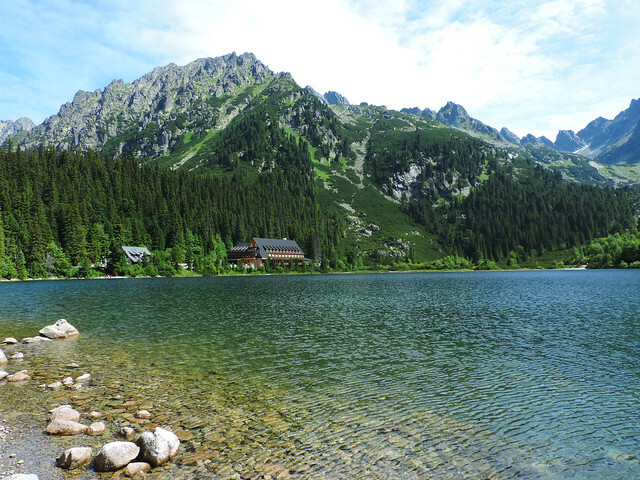 It’s the most accessible lake in the High Tatras and several trails start from there. A huge parking lot is located just 5 minutes walk from the lake. If you are looking for a very short and easy walk then there’s a loop trail around Štrbské pleso. It takes only about 40-50 minutes and it’s all flat. If you are there to do some hiking though then it’s a nice warm-up. We think the best introduction hike to the High Tatras is the red route from Štrbské pleso to Popradské pleso. It’s still quite easy (elevation change is only about 150-200 metres) but very scenic from one stunning alpine lake to another. The trail starts in the forest but you get your first vistas soon and they remain all the way to Popradské pleso. And further… Because you can definitely hike further! In addition to the easy loop trail around Popradské pleso there are a bunch of more challenging options: trails to Veľké Hincovo pleso, Batizovské pleso or Rysy peak. 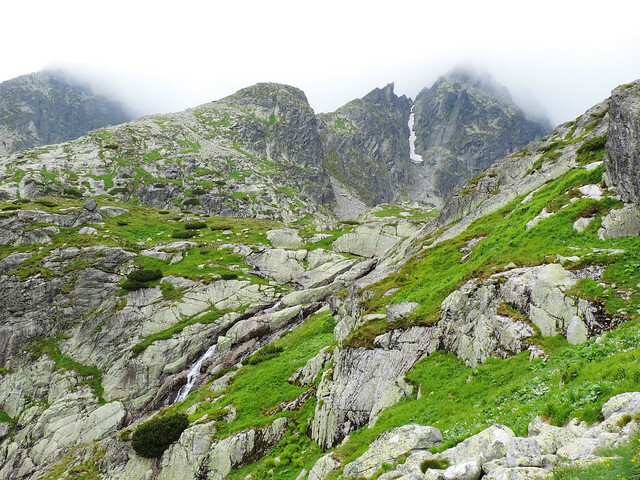 Read about our favorite day hikes in the High Tatras here! Little Fatra National Park as its name indicates is a small one – roughly 230 square kilometres. It’s that park you can explore in a couple of days but it will tempt you back again and again. Because it’s a lovely place with beautiful pine forests, stunning mountain ridge trails and picturesque canyons where you can climb up right next to lovely waterfalls. And it has 3 peaks above 1300 meters (Veľký Kriváň – 1709 m, Veľký Rozsutec – 1610 m, Malý Rozsutec – 1343 m). 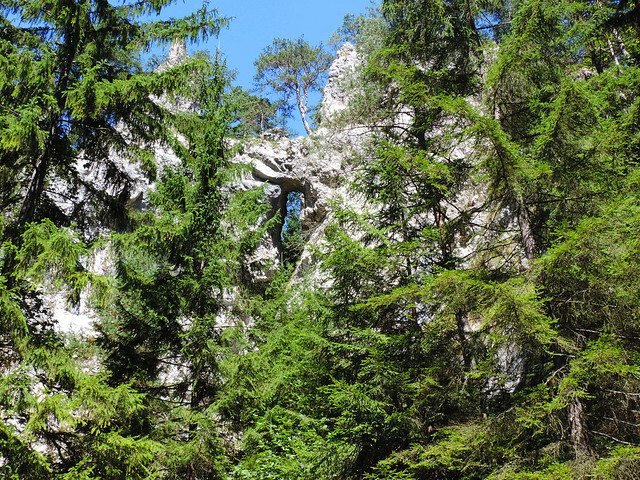 The loop trail through Horné diery gorge and then two photogenic peaks is a perfect introduction to all the pretty features of Little Fatra. The two peaks, Malý Rozsutec and Veľký Rozsutec are the crowns of Little Fatra: unique rock formations in the middle of the pine forest. The trail is quite steep at some sections and it’s secured by chains and iron ladders in the gorge but it’s so much fun! 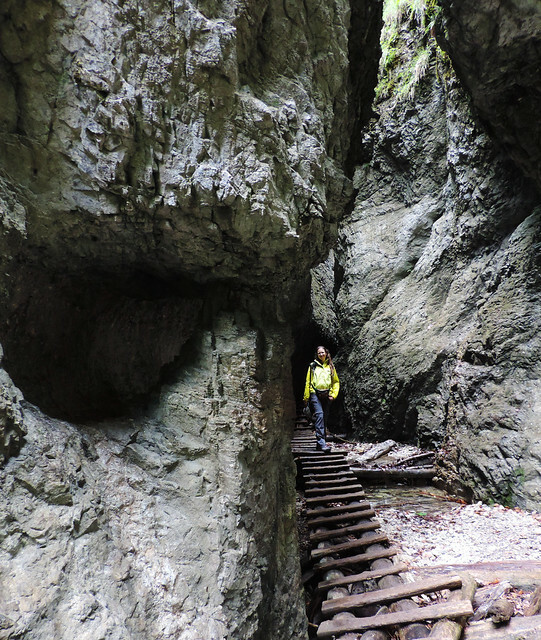 And if you are looking for something easier you can skip climbing Malý Rozsutec and head to Veľký Rozsutec directly after the climb in Horné diery gorge. Slovak Karst National Park is a beautiful karst region in Slovakia. It has fascinating dripstone caves to take your breath away and 3 of them is open to public: Domica cave, Jasovská cave and Gombasecká cave. The karst region is very close to the Hungarian border and actually, Slovakia and Hungary shares this natural wonder listed as a UNESCO World Heritage Site as “Caves of Aggtelek Karst and Slovak Karst”. Our favorite hike in Slovak Karst National Park is the loop through Zadielska Valley (Zadielska dolina in Slovak) and its plateau. Zadielska gorge is the deepest gorge in Slovakia (300 meters deep) and it creates small waterfalls and cascades in the valley. It’s narrowest point is only 10 meters wide. The red route takes you through Zadielska valley then the blue route takes you up to the top of the plateau. You can get back to the bottom again at the end of the plateau. Of course, you can hike back on the same way in the valley if you want but views from the plateau are spectacular! Low Tatras National Park covers the whole Low Tatras mountain range and it’s the largest national park in Slovakia. It’s home of some of the most spectacular caves in the country (like Demänovská Ice Cave or Demänovská Cave of Liberty). And it’s a beloved hiking destination, too. One of the most popular hikes is conquering Ďumbier (2043 m) and Chopok (2024 m) peaks. They are the two highest peaks of the Low Tatras and they offer amazing views! On a clear day you can see almost all Slovakia and even Hungary in the distance. So that is the hike I’m suggesting as an introduction: climbing to the two highest peaks? Uhm… Exactly. The trail is about medium difficulty and once you reached Ďumbier it would be a pity to turn back. Because the trail continues on a mountain ridge to nearby Chopok and it’s very scenic all the way. All in all, the Ďumbier-Chopok loop is a wonderful full day hike. In addition, you can conquer the Low Tatras twice on your first day there. We didn’t say no. Great Fatra National Park was founded in 2002 so it’s the youngest of all national parks in Slovakia. 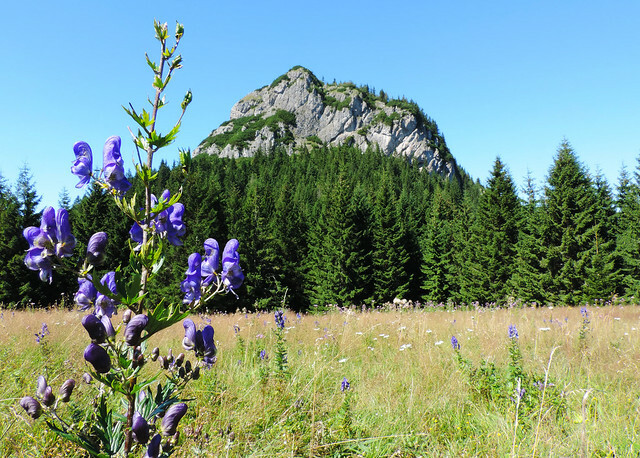 It’s located southwest of Little Fatra and contrary to its name it’s actually lower with its highest peak Ostredok at 1592 m. About 90% percent of the park is covered by forests and most of its hiking trails are long and they lead you into the beautiful wilderness. Some of its most popular long valleys are Blatnická, Gaderská, Ľubochnianska, Revúcka, Harmanecká or the valley of Biely potok. 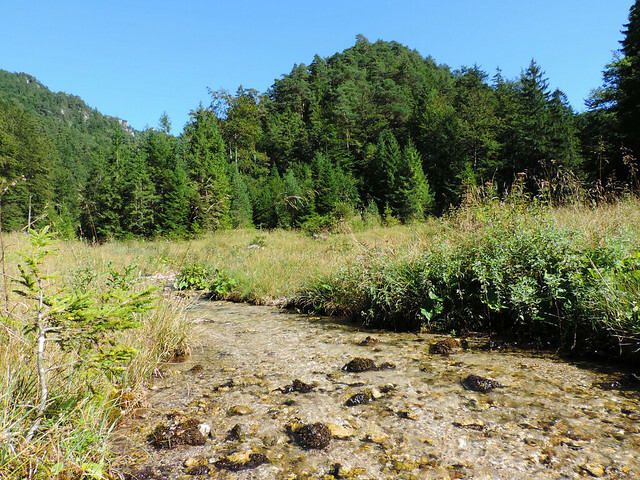 We chose Blatnická Valley (Blatnická dolina in Slovak) as our first hike and it was such a lovely one! It’s a long but quite easy walk in the peaceful valley of Blatnický river with some wide meadows and peak views occasionally. To be honest it’s a very long valley and we didn’t go all the way just until somewhere near Juriášovo crossing. But you can measure the time for yourself and decide based on that. Anyway, it’s good to keep the general bear safety tips in mind. In a nutshell: make noise (talk loudly, sing, clap) to make your presence known, in case of an encounter don’t ever turn your back to the bear and try to leave the area slowly. You can check this for more details, but there’s tons of good advice out there on the internet about bear safety. Have you been to any of the national parks in Slovakia? Which one is the most tempting to you?